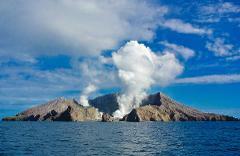 Journey to New Zealand's most active volcano! Met at Port Tauranga, travel to Whakatane & then cruise to island. 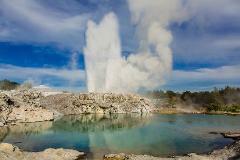 Guided tour, view roaring crater lake of acid, boiling mud pools, hot volcanic streams, steam vents & sulphur formations. Guests are met at Port of Tauranga, & join tour bus for trip to Hellsgate. 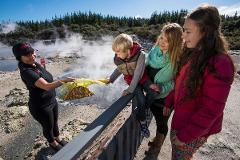 Enjoy a self-guided tour of the Geothermal park, & learn about native flora & fauna. Boiling Mud Pools, Steam Fumeroles & Vents, HOT Waterfall, and Mud Volcano! 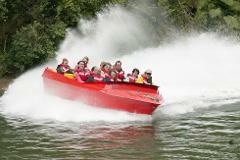 The Kaituna Forest Canyon River Jet is a top New Zealand Jet boat experience . 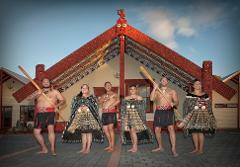 With the excitement of winding rivers, sharp corners and surrounding dense native New Zealand bush. Be thrilled with fast corners and spins & incredible scenery!